Sakhigopal Temple is a highly revered shrine situated at Satyabadi, about 22 km from Puri, in Odisha. It is one of the famous ancient temples situated en route to Konark. 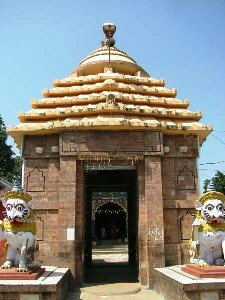 Sakhigopal Temple resembles a miniature temple of Jagannath Temple at Puri. The temple enshrines a life size image of Krishna, standing with a flute, with Radha standing on the left side. The images of Krishna and Radha are very impressive. It is believed that the idol of Krishna was brought here by King Prataprudra Deva after his victory over Kanchi (South India). The annual fair held here on the Anla Nabami day in the month of Kartika attracts thousands of people from far and near. A popular belief among the devotees is that the pilgrimage to the Jagannath Temple at Puri would not be complete without a visit to this temple.